Physical therapy jobs will grow 28% by 2026. You can jot your resume on the back of a blank assessment form and get the job. If you want just any PT job, then yes, rush through your resume. But if you'd like an easy life and a high physical therapist salary, you'll need a superior PT resume. So, show skills and achievements that match the job like interlocking vertebrae. The good news? It's not hard to write a resume that gets the best PT jobs. You just need a little expert help. A physical therapy resume example better than 9 out of 10 other resumes. How to write a physical therapist resume that lands more interviews. Tips and examples of how to put skills and achievements on a PT resume. How to describe your experience on a resume for a physical therapist to get any job you want. Here's a physical therapist resume template made with our online resume builder tool. PT Resume Example - See +20 resume templates and create your resume here. What's the Best Format for a Physical Therapist Resume? Picture a hiring manager. Her name's Clara. Nice "I get paid to hurt people" coffee mug. Near the mug, she's got a stack of 249 PT resumes. If only you could find some way to make your resume stand out. Just start with the right layout. The chronological resume format is the best physical therapy resume format. Why? Because it doesn't waste time showing your best skills and achievements. Guide the reader's eyes with soothing white space and clear headings. Use only the best resume fonts. Finally, save it as a PDF. "But I've heard PDF resumes confuse Applicant Tracking Software." That was true five years ago. Modern PDFs are machine-readable. Always send a physical therapist resume PDF unless the job offer says otherwise. Pro Tip: Switching careers? Got resume gaps? Consider the combination resume format for your healthcare resume. It shows your relevant experience from lots of different sources. Imagine you've got six seconds in an elevator with the hiring manager. That's not far off. Research shows most managers spend that long on each resume. How can you grab her attention like you're doing bodywork on her? Answer: With a resume summary or a resume objective. A resume summary impresses the manager with your achievements. Use one if you're no stranger to arthritis and CTS. A resume objective wows them with your passion. Use it if you haven't even started payments on your $120,000 college debt. Stuff either with enough achievements to stun Eric Robertson or Karen Litzy. The experienced physical therapy resume examples below show how. Which of these experienced physical therapist resume samples would you rather use? Registered physical therapist looking for new position with room for advancement. Excellent attitude. Skilled in patient assessment, creating plan of care, and therapy intervention. Ready to start immediately and will work very hard. That's not exactly a hip replacement, but it won't bathe you in interviews. Engaged, licensed PT with 3 years of experience, seeking to employ proven pediatric PT and assessment skills to deliver excellent patient experience at Sunny Creek Wellness. Received 98% positive ratings from 40 regulars at Active G Pediatrics. Achieved 85% success to patient goals. Wow. The manager would have to have a surgical screw loose to skip that resume. "But I don't have that much experience." If you're writing a PT or physical therapy aide resume with no experience, see the examples below. Still a rookie PT with no experience? Entry-level physical therapist with no actual on-the-job experience, but I'm a fast learner and a hard worker. Skilled in geriatrics and patient assessment. That's as helpful as tennis elbow. Licensed physical therapist skilled in pediatrics and patient family education. Scored top of the class in Movement Science at Florida Gulf Coast U. Volunteered at Cypress Stream Nursing Home and St. Bonaventure Clinic. Commended multiple times by management for compassion and efficiency. What a comeback! Remember our manager, Clara? She's impressed. And yet that even works in a physical therapy school resume or physical therapist assistant resume. Pro Tip: Keep your PT resume summary or objective short. It just needs to share 1-2 achievements that will make the manager read on. Who gets the best physical therapist jobs? The applicants with the most experience? Or the ones who show it best on a resume for physical therapy? Would you be shocked to know it's option #2? See, showing lots of experience is good. But the hiring manager is faced with lots of "good." She'll pick the applicant who fits the job description like a custom exercise routine. Read the job ad carefully. Make note of the duties and responsibilities you see. Build your experience section from bullet points that match those things. Let's picture a PT job that values patient education, likeability, and creating plan of care. Pediatric PT in busy clinic. Commended by management for patient education. Maintained 40 regular clients. Received 98% positive parent scores. Created plan of care for 200+ clients. Earned 85% success to patient goals. That's better than a full body massage. The applicant could have picked dozens of other bullet points. She chose to focus on the ones that fit the job. But don't do it like this next clip from a resume for a physical therapist. Pediatric PT in busy clinic. Performed all PT duties, including family education, assessment, and all documentation. Performed therapy interventions on a roster of regular clients. In charge of creating plan of care for all my patients. See that? Where are the details? This could be anyone, applying to any PT job. A great physical therapist resume needs measurable accomplishments that fit. "But I don't have any measurable accomplishments," you say. Like a discouraged patient, you're not giving yourself enough credit. Want proof? It's in the next two new grad physical therapy resume examples. Need experience for a resume for physical therapists? Volunteer work. Local clinics and senior care centers are often short-staffed and welcome volunteers. Even a few days can save a sagging PT resume. Physical Therapist Internships. Are you fresh out of physical therapy school? n (often unpaid) short-term internship makes great experience. Observation hours. While obviously not as good as two years of experience, you can list these on your resume. Transferable experience. List any time you worked with the public, gave instruction, or worked in healthcare on your PTA resume. Even coaching gym members can count. Let's run through this with two entry-level physical therapist resume examples. Physical Therapist Experience: Just graduated and haven't held a job yet. Ouch, RICE that, will you? Volunteer PT, Cypress Stream Nursing Home. Commended for efficiency. Volunteer pediatric PT, St. Bonaventure Clinic. Assessed 10 patients. Personal Trainer, Gilly's Gym. Instructed 200+ clients in key training practices. Full recovery. Yet it even works on physical therapy assistant resumes with no experience. Pro Tip: Does all this tailoring sound hard? Once you've got a good physical therapy resume template, it'll only take a few minutes to adjust to each offer. How much does education matter on a PT resume? That doctorate and license are no joke. But with a small adjustment, you can make yours unlock a flood of interviews. Then add achievements that link you to the job like cable weights. Picture you're applying for a job that asks for movement science and pediatrics. 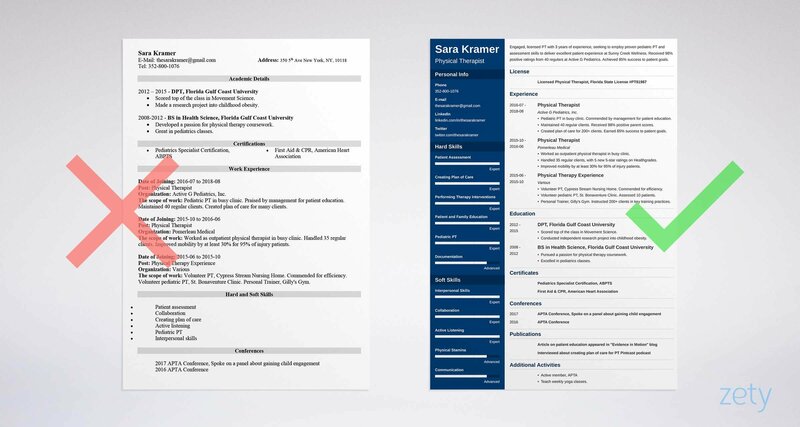 Which of these new grad physical therapy resume examples does it right? Scored top of the class in Movement Science. Conducted independent research project into childhood obesity countermeasures. That's not just "blah, blah, blah, I got my doctorate." That's someone who was born to do this job. That's like a repetitive stress injury in paper form. But add those details, and you're back up to the Kyle Ridgeway level. Pro Tip: Did you score really high on the NPTE exam? A high score makes a good addition to an entry-level physical therapy resume. What if you convinced the hiring manager you're the most skilled PT on earth? That's kind of what you have to do. Don't write a long list of skills and say you've got them all. You might as well replace your resume with, "I'm exactly what you're looking for." It would work if everyone believed it. But they won't. Your PT resume must do more than listing skills. It has to focus on the few skills the manager is looking for. It must show "snapshots" of you using those skills well. Let's look at how that works, in two outpatient physical therapy resume examples. They're for a job that looks for interpersonal skills, creating plan of care, and performing therapy interventions. That's just a list of all the physical therapist skills there are. You know how that PT hiring manager can spot a rookie? A resume skills list just like that. So, find the crucial skills in the PT or physical therapist assistant job description. Then, paint a picture of yourself succeeding at them. Worked as outpatient physical therapist in busy clinic. Commended by management for interpersonal skills. Created plan of care for 35 regular clients, with 5 new 5-star ratings on Healthgrades. Performed therapy interventions, increasing mobility by at least 30% for 95% of injury patients. That's no mere skills list. That's someone who knows her way around an ultrasound unit. Need some sample physical therapy resume skills to get you going? See below. This physical therapist resume keywords list should get you started. Find more skills in job offers online, and in your own experience. Use the plan above, and your resume for physical therapy will bounce like an exercise ball. Pro Tip: You may have millions of PT skills. Even so, your resume needs focus. It's hard, but dropping most of what the manager's not interested in will get you to the interview. How hard did you work for that physical therapist license? Hard enough to cause half the illnesses you treat? You need to make that license stand out like a hydrotherapy tub full of $100 bills. So, put it after your name. Add it to your resume summary. Notice we've put certifications in a separate section. We don't want to lose that $120,000 license near a $30 cert. Pro Tip: Should you put your license number on a PT resume, or keep it confidential? It's publically available on the FSBPT website, so by all means, add it. Think all your physical therapy resume needs is experience and education? Our hiring manager, Clara, wants to read a resume. She wants to hire a person. Show her you're the kind who goes the extra mile, with special "other" sections. No judgement here. But do those prove the manager will be glad she hired you? Volunteer 2x per month walking dogs at local animal shelter. That provides electrical stimulation to the hiring manager. It shows a PT who cares enough to get involved. Pro Tip: Should you join the APTA? It looks great on a physical therapy resume. Plus, the networking alone can get you interviews and jobs. How About a Physical Therapy Cover Letter? Wait, most recruiters don’t read cover letters, so do you really need a physical therapist cover letter? You don't need one that says, "Please throw this piece of paper away." "Hello, I'm applying for the job and here's my physical therapist resume," will do just that. What's the key to a great cover letter for physical therapy jobs? Make it personal—use the hiring manager's name. Show you understand the job. Show how you can help. End your cover letter with an offer. "I'd welcome the chance to show you how I earned 7 5-star ratings on Healthgrades" works great. Pro Tip: If you can prove you're motivated to work hard at this job, you're a lot closer to getting hired. Find something you love about the job goal and put it in your physical therapy cover letter. Let's say you wrote the perfect physical therapy resume. It's so good it cured the recruiter's bursitis. The problem? You goofed your contact info. The manager got peeved and moved on to another applicant. But also add your LinkedIn profile. 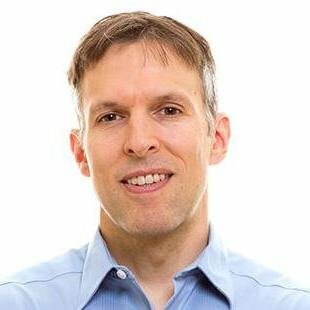 A great physical therapy professional profile on LinkedIn can energize your interview rate. That's because 87% of recruiters hire from LinkedIn. But: know now how to pick a profile photo, write a LinkedIn summary, and rack up the right endorsements. It's all in our dedicated guide to LinkedIn excellence. Pro Tip: Are you afraid the hiring manager will look you up on Facebook? Be afraid. Be very afraid. Check your online presence before you even think of sending out that PT resume. It all starts with the job description. Read it and highlight what they're looking for before you even start your physical therapy resume. Craft your bullet points so they plug into the job ad like a brand new hip joint. Add plenty of measurable achievements. Include other sections to your resume for physical therapy. Show you thrive on this stuff. List volunteer work, APTA status, and of course your license number. Do you have questions on how to write a great resume for a physical therapist? Not sure how to describe your skills or achievements? Give us a shout in the comments! We love to help! How to pick the best resume format to make sure your application stands out? 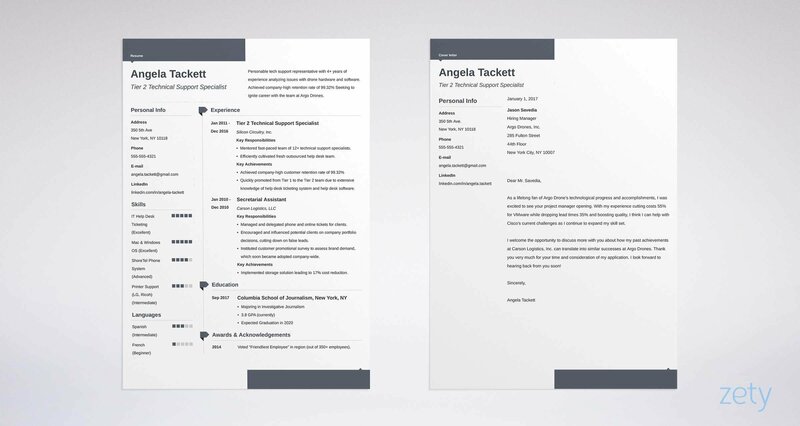 Learn from our handy guide on resume formatting. Read more! A step by step guide to writing a professional resume for medical assistant. Use our medical assistant resume sample and a template.